DARK TEMPEST includes 10 full-page illustrations by award-winning artist Brittany Jackson. I adored Red Winter, the first book in this series. In fact, I’ve already written a very gushy review about it. I was doubting whether to give it 4,5 or 5 stars and ended up at 5. But Dark Tempest? Five stars feel insufficient. It was amazing and I loved every single minute of it! Dark Tempest has exceeded Red Winter in every way possible and has become one of my all-time favorite sequels. The mythology and worldbuilding was already so well developed in Red Winter. But that was actually just the introduction. Dark Tempest takes it so much further. We learn more about the world, we get to know new and fascinating (and sometimes really creepy) creatures. We learn more about the Amatsukami and Kunitsukami. Where Red Winter was a nice dip into a fascinating new world, Dark Tempest just dives right into the deep. The action was already fast-paced and one big adventure in Red Winter. But Dark Tempest takes everything to an epic new level. Over the course of one book we have the human politics, we go all over the world in search of missing Kunitsukami, we toboggan on snow-covered mountains, we travel through creepy misty woods, we stumble through dark and scary caves and we battle a whole lot of dangerous creatures. The pacing is perfect as we go from one adventure to the next. The characters were already intriguing and well-written in Red Winter. But Dark Tempest is where your love for them will intensify. Emi is one of my favorite heroines. This little human girl may be the bravest of them all and can hold her own in the midst of all the powerful yokai she meets. The amount of development she has already gone through since the start of her story is just astonishing. Shiro… I love Shiro. Our little mischievous kitsune has his own journey to go through, and Dark Tempest finally gives us some answers as to his mysterious past. Yumei is still kind of the stoic, grumpy ally of the gang, but while I wouldn’t call him lovable by any means, I’ve still gotten really attached to this Prince of Shadows. Also, we meet some new characters here who are just as intriguing as the rest of them. The romance was already simmering quite slowly in Red Winter, but Dark Tempest brings out the swoons big time. Again, there is so much going on, so it never really feels like the romance is overpowering the story, but what we get is sizzling with electricity. Emi and Shiro are great together and I love how they work as a team – constantly saving eachother. I loved their banter. And just like in Red Winter, the amazing illustrations help bring the story to life. Key scenes in the book are visualized so gorgeously and perfectly! It’s definitely a treat and I almost wish Brittany Jackson could illustrate all books. I can’t not gush about this series and this book in particular. I love every aspect of it and it has quickly wormed its way into my all-time favorites. All I can do now is wait patiently for the final installment in the trilogy, be happy it already will be released in March so I don’t have to wait too long and get as many people to discover this wonderful hidden gem as I possibly can. “That makes me stubborn, not strong,” she mumbled. 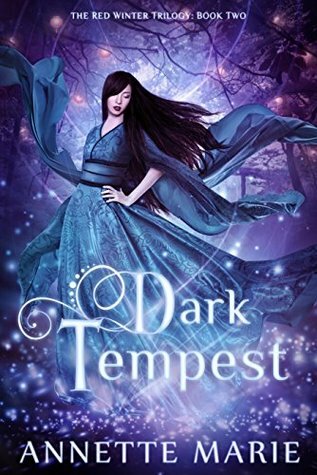 Have you read Dark Tempest? What did you think about it? Yes, I’m definitely a bit obsessed with this series 😉 Hope you’ll enjoy it as well if you decide to pick it up!